Usually it’s movies that I come here to write about, but this series (17 episodes, about 30 minutes each) needs at least a mention. I’ve been a fan of Errol Morris’ documentaries ever since I saw The Thin Blue Line back in the 80s. It was different than any documentary I had seen before. It was as if the subjects being interviewed were talking directly to me. Years later I’d learn that this was the result of an invention created by Morris, aptly named by his wife; The Interrotron. It’s an ingenious system that uses two way mirrors to project Morris’ face where a lens would usually be. This gives the subject a human face to speak with and evidently makes them forget that they are on camera after awhile. Morris has built a pretty nice career as one of the most respected documentarians of our time, despite the fact that he openly admits that he’d rather make narrative features, but suffers from writers block and the subjects in documentaries do most of the writing. It should be noted that the upcoming Freezing People is Easy (due out in 2013) starring Paul Rudd, Kristen Wiig, Owen Wilson and Christopher Walken will be directed by Morris and I don’t think I need to tell you that it’s not a doc. This will be his first non doc and it’s got me pretty curious. 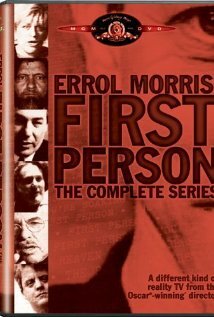 All that aside, I’m here to sing the praises of his short lived television series called First Person. In 17 episodes, Morris interviews 17 subjects that range from a squid scientist to an author who met and married not one, but two serial killers. Other interviews include a mob lawyer, a man obsessed with cryogenics, two different certifiable geniuses (both have worked as bouncers incedently) one of which repeated his senior year of high school a multitude of times and on purpose before he went on Who Wants to Be a Millionaire only to lose and later sue the program. Needless to say, these are interesting folk. Morris’ style is very recognizable, but more importantly, it works. He won an Academy Award in 2004 for The Fog of War, what I consider one of his less imaginative efforts. If 17 episodes is too much of a commitment (it’s well worth it) then I’d recommend Mr. Death, where Morris examines the life of Fred A. Leuchter Jr. All you should know about Mr. Leuchter going in is that he was the leading American execution device designer, “was” being the operative word here. Don’t even read the tagline or brief IMDB description for full effect. Either way, if you haven’t yet acquainted yourself with Errol Morris and his subjects, it’s high time that you do. Posted on Thursday, August 9th, 2012 at 10:13 pm and is filed under Reviews.